After one week of using a meal kit delivery service, the home chef in me was ignited and wanted to continue. Hence, I sought out other Toronto companies and Prepd graciously offered a week of meals to prolong my culinary creations – something my husband was happy about as well. Prepd’s Sunday delivery date works the best for my schedule: I like being home to put everything into the fridge as quickly as possible (although Prepd froze the proteins and there were tons of ice packs so could be left outside for a while) and gives me a chance to cook one of the meals on Sunday – the evening I’m home the most and generally have time to cook. Similar to competitors, ingredients are clearly labelled and packaged (except proteins) into a separate bags for each dish. With the exception of salt, pepper, and oil, everything required for the recipe arrives in the kit. Simply wash and prep the produce and you’re ready to go. 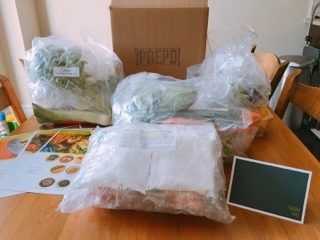 I particularly like that Prepd offers a pick-up service to return boxes and ice packs. Yes, I know items can typically be recycled, but manufacturing and even the recycling process still uses resources and energy, so anything we can do to re-use something helps the environment. 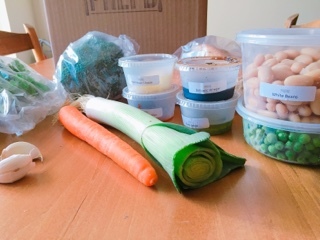 Additionally, their boxes were smaller (fitting all the ingredients perfectly) and were less reliant on unnecessary packaging (for example, not wrapping items such as carrots in plastic wrap, instead just placing them in the bag). 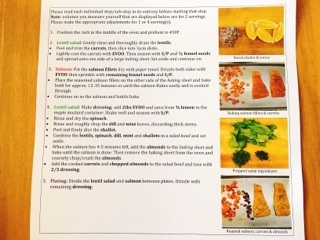 Overall, recipes were very straight forward, laying out instructions in chronological order. For example, the recipe would indicate to continue making the salad while something is in the oven, so you literally just follow the directions step-by-step. Looking back, there may be a few steps I’d process differently – in the lentil salad mixing in the herbs and shallots with lentils first, then adding the spinach as after adding the leafy vegetable it makes everything difficult to combine – but, it’s a very small change. Prepd also required minimal equipment. With the salmon recipe, the carrots and almonds were also placed on the same baking sheet, so everything’s essentially made in “one pan” minimizing cleaning. Even the dressing for a salad could be made in the container holding the mustard – add oil and vinegar into the mustard and shake up to create the dressing. Wow, the recipes sure incorporate a lot of herbs and spices. 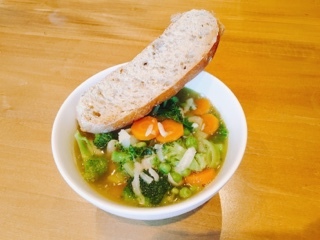 Even the vegetable soup combined pesto and vegetable bullion to make a very flavourful soup. Moreover, the selection of vegetables (carrot, leek, kale, onion and broccoli) created different flavours and textures to add interest. Including white beans into the dish made it hearty and filling (even more so with the generous portions of toasted bread). With plenty leftover, this re-heated nicely for lunch the following day. 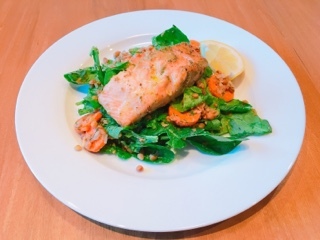 My favourite meal was the salmon salad – fantastic hot the night of and cold for lunch. To be honest, after looking at the ingredients, I was skeptical whether I’d like the dish: carrots, dill, and chopped almonds? Not exactly my favourite things, let alone mixed together in a salad. Boy was I wrong! The sweet carrots with the dill and lentils actually worked nicely together; the chopped almonds much better than the slices I find too crunchy. The lamb and beef koftas was the sole dish that tasted mediocre, simply due to the overpowering dry meat patties. Unfortunately, since I haven’t used their spice mix before, it’s hard to judge how much to add “to taste”… especially, when you’re adding it to raw meat – how do you even taste? Knowing how strong chili powder is, I already decreased the amount that came with the package, but unfortunately didn’t know what to do with the spice mix. Adding it all was a big mistake - the kofta became grainy and overly citrusy. The patties were also hard to bind together, something wet (other than using wet hands to form the kofta) would definitely help and make the meat moister. 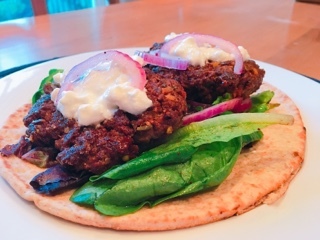 With something already so flavourful, the condiments could have been toned down – the yoghurt would have been better plain, I found the additional feta made it too thick and salty. Also, the garlic incorporated in the yoghurt would have worked better in the meat, as the pungent raw garlic along with red onions was too much. Just imagine how great your breath smells afterwards. Prepd’s recipes inspired me to combine a variety of ingredients and herbs together. At times, I didn’t think I’d necessarily like everything, but never one to not try something, I followed the formulas and (for the most part) wasn’t disappointed. Although the dishes don’t necessarily look the most exciting from the pictures, they were actually full of bold flavours and with such generous portions, enough to try again the following day. If you’re living by yourself, congratulations – Prepd has a one person plan! With three meals per week, it will cost you $40 or $13.33 per meal. For two and four people, the three meal plans and both work out to $10 a meal ($60 and $120 for the two and four person, respectively). All prices are inclusive of taxes and delivery charges – definitely one of the most economical services. At any time, you can pause or cancel your plan. So, you’re not committed to having to order a meal kit every week. Want to try it for yourself? 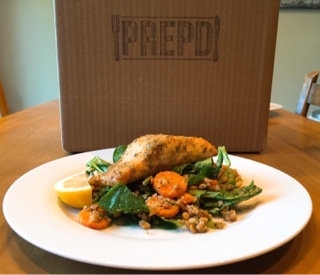 Prepd is offering Gastro World readers $20 off your first order for new customers. 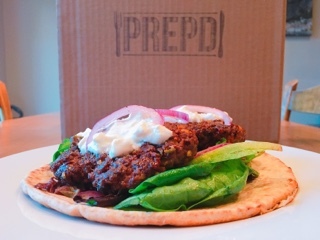 Just use the code gastr581f3a6730928 on their website - http://eatprepd.com/.